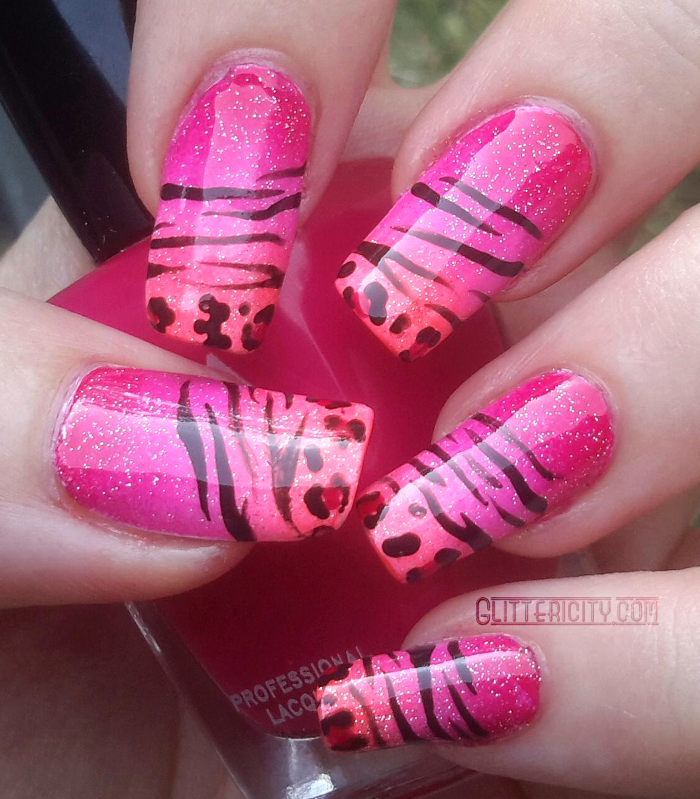 I did a variation of this on a nail wheel a long time ago, but wanted to stick with a more similar colour scheme. I am sorry to report that these photos don't do this justice at all--the neon is so bright in real life. But click the jump to see more! 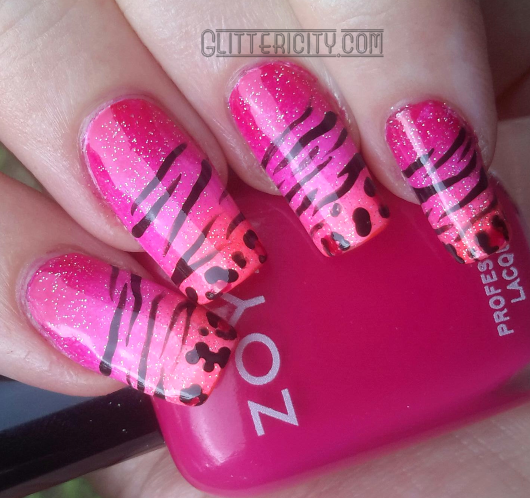 I used Zoya Charisma at the base, Nina Ultra Pro Vio-Let It Ride in the middle, and China Glaze Pool Party (original formula) at the tips--making a gradient with a makeup sponge, of course. I did this over white so the colours would pop. Over this, I did a thin coat of China Glaze Fairy Dust, widely renowned as one of the loveliest glitter polishes ever made. It's perfect for when you want a touch of holo sparkle but don't want to dull the base colours at all. 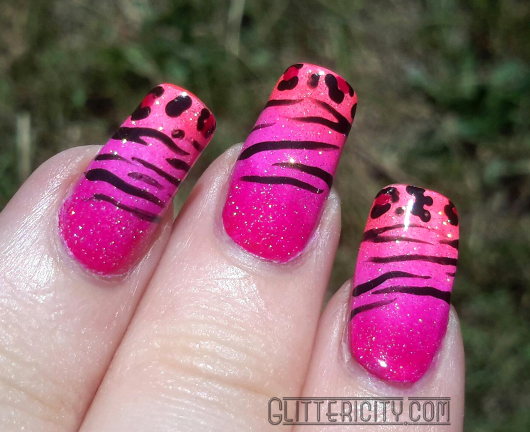 I did the animal prints with acrylic paint using a striping brush and small dotting tool, then sealed it all in with Sally Hansen Big Shiny topcoat. Yeah, I decided to try something new on top! 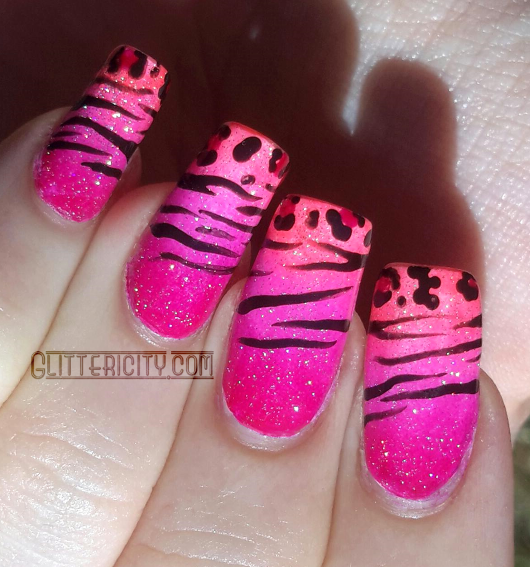 It takes a little longer to dry, but is just as glossy and doesn't shrink at the tips as much.